You want to buy American when you can. Right? Support American workers. Yes? Get a dependable, good looking, efficient car to haul you and your friends around? For sure! What is the most “American” sedan? What brand and model can check all the boxes? Toyota can. The long-running, popular Camry is designed, engineered and built in the U.S. (Georgetown, KY) with more (according to Toyota) domestic content than any other car and it comes with Toyota’s legendary quality. Now, with this new version, it has enough style and panache, and even increased power, to please just about any buyer. 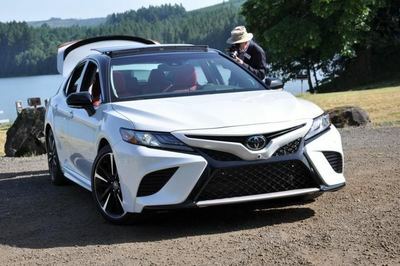 Toyota hosted a gaggle of journalists in Oregon this week to get the story first hand from executives and engineers, have a look at, and a first drive in, the newest iteration of the ubiquitous Camry. 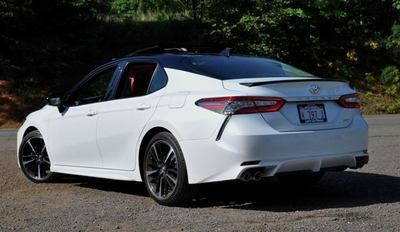 This eighth generation of the venerable Camry is on an all-new platform called Toyota New Global Architecture – 30% more rigid, with new dimensions, new suspension geometry and upgrades in just about all systems. Lighter weight materials, including an aluminum hood and thinner steel elsewhere in the body, along with the use of more high-strength steel in the substructure contribute to lighter weight and a more lithe and agile character. It’s also just a smidge lower, wider and longer. The engineers insist one of their goals was to give it a lower center of gravity. At first blush it looks like a logical evolution of the style and design that has been getting more bold and brash with the last two updates of this mainstream, best-selling sedan. A lower hood, narrower A-pillars, brash front fascia and attention to aerodynamic tricks both freshens its looks from the front and improves its ability to slide through the air. Deeper, more detailed body sculpting along the side and around the back maintain the sportier theme. The top trim levels also include dual exhaust with quad, chrome exhaust tips – something we did not expect from Camry. They’ve added some flashy new colors, including a two-tone scheme, and they even offer an interior trimmed in red leather. 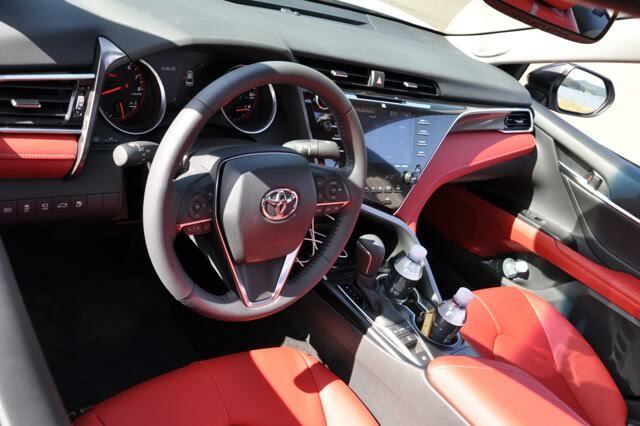 The new Camry’s stunning new interior design got the most raves at the launch event. Aesthetics and functionality come together beautifully with artful intersecting curves. Toyota designers call it a “waterfall” design. Varied upscale materials provide the framework for the information and control functions. The larger-than-usual information screen between the speedo and tach were not the most intuitive and are lit a bit too dimly for my old eyes to read. The large multifunction touch screen features the first use of the third generation of Toyota’s Entune suite. The center stack is ever so slightly tilted toward the driver for a bit more convenience and the USB, auxiliary and power ports are at the base of the center stack where access we can get at them easily. Seating is updated front and rear, with the passenger seat now available with as many power settings as the driver’s seat. More attention to interior quietness went into the car, but I can’t offer my assessment of that until the above-referenced embargo is lifted. That would fall under driving impressions after all. Trunk capacity is improved for the hybrid Camry by moving the batteries from under the trunk to under the rear seat. I could not discern any less room in the back seat though. They’ve also repositioned the battery pack from under the trunk to under the rear set leaving more room for cargo. The three powertrains – a 4-cylinder, V6 and hybrid – all get updated with more sophistication and bump-up in power along with a new 8-speed, direct shift automatic transmission for the 4- and 6-cylinder models. Unlike other manufacturers Toyota decided not to go the turbocharging route with smaller displacements to achieve better performance and mileage, rather they’ve increased horsepower and torque in part by way of a new dual injection, that is, direct augmented with port injection. The 2.5-liter four-cylinder now boasts 206 horsepower and 186 pound-feet of torque while the 3.5-liter V6 now makes 301 horsepower and 267 pound-feet of torque. We’ll offer our impressions of the feel of these updated engines and fuel economy numbers when the embargo is lifted. 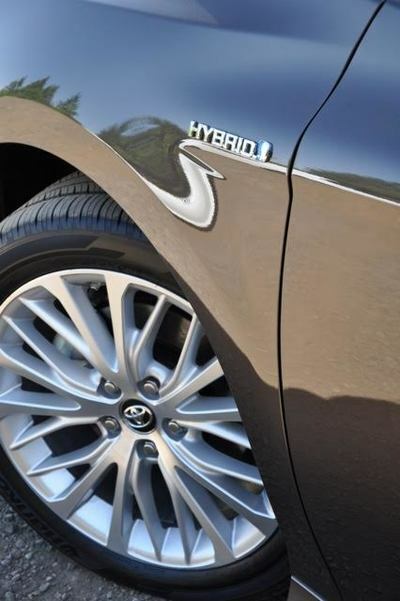 The hybrid gets an updated CVT that pretends to shift like a conventional 6-speed automatic and even has sort of a manual mode. In terms of safety, all Camrys come fully equipped with Toyota’s Safety Sense P™ which bundles high-tech features like Pre-Collision System with Pedestrian Detection, Dynamic Radar Cruise Control, Lane Departure Alert with Steering assist and Automatic High Beams. All models also get Toyota’s Star Safety System ™ that includes stability control, traction control, EBD, brake assist, backup camera, ABS and Smart Stop Technology ™. Select models also get Blind Spot Monitor and Cross Traffic Alert. Camry buyers will have a plethora of trim level choices when they become available at dealers by late July. You’ll have five to chose from with four-cylinder power, two with the V6 and three Hybrid choices. Prices will be posted later as well. The market seems to be moving rapidly toward crossovers at the cost of sedan sales but the product planners at Toyota see this as an opportunity. As they update the most popular sedan in America they think they can hold on to their big piece of that still very large market. Like all segments of the auto market this one is intensely competitively. If a manufacturer does not regularly update its vehicles market share can wane very quickly. My money is on Toyota to continue leading this market.